A judge rules that a lawsuit by the New York State attorney general can proceed against Donald Trump and the Trump Foundation, with allegations of misused charitable assets, self-dealing, and finance violations during the 2016 Presidential campaign. Trump’s lawyers argued that the court did not have jurisdiction over their client, as President, and that the statutes of limitations had expired in some of the cases. They also asserted that the attorney general’s office had a “pervasive bias” against Trump. The ruling is the second by a New York State judge this year that Trump is not protected from civil court cases that involve his unofficial activities or actions that took place before he took office in January 2017. In June, Justice Jennifer Schecter ruled that a lawsuit can proceed against Trump for his alleged defamation of women who accuse him of sexual misconduct. The suit was brought by Summer Zervos, a former contestant on Trump’s reality show “The Apprentice”. Scarpulla also cited the decision to allow a sexual harassment suit brought by Paula Jones against Bill Clinton while he was President from 1993 to 2001. 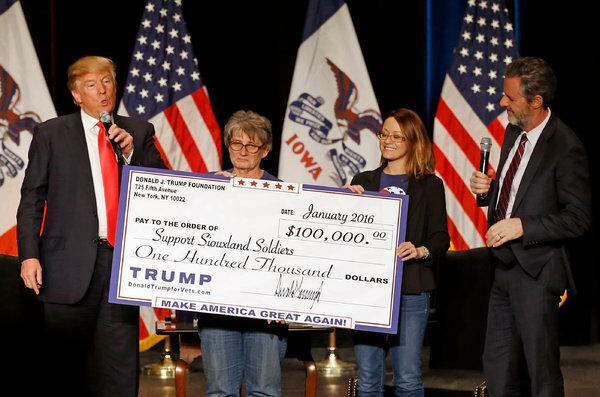 New York State Attorney General Barbara Underwood filed the lawsuit in June after a two-year state investigation found that Trump and his family had improperly used the charity to settle business disputes and to bolster his campaign for President, involving it in a 2016 political fund-raiser in Iowa. Trump and two of his children, Ivanka and Eric, are named. Underwood is seeking to restitution from the foundation of $2.8 million in restitution, and a ban on Trump from running another nonprofit organization for 10 years. Judge Scarpulla rejected the argument of Trump’s lawyers of bias by the Attorney General, “given the very serious allegations”.